two more inmates on death row. Lee, 51, had been sentenced to die more than 20 years previously for beating Debra Reese to death with a tire iron. He was finally executed just before midnight in the Cummins Unit, a prison in southern Arkansas. He was the first inmate to be executed in the state since 2005. He had always maintained his innocence. He had unsuccessfully appealed to the courts for a stay so that evidence in the murder could be analyzed for DNA traces that might prove that he did not commit the crime. He refused a final meal and asked for holy communion instead. He did not give a final statement. The first drug was injected at 11:44 PM; he was declared dead at 11:56. An Associated Press reporter, Sean Murphy, was present at the execution as a witness. He noted that Lee was not visibly uncomfortable during the execution process. "Barring doctors from executions will only increase the risk that prisoners will unduly suffer. ... perhaps the best protection against a botched execution is to have a doctor trained in anesthesia or palliative care be present when things go awry. ..."
"I recognize the moral quandary that the situation presents for doctors whose hope is that killing by the state will end. But as Arkansas has shown, states will go to great lengths to execute criminals, even at the risk of causing undue suffering. Inmates Jack Jones and Marcel Williams had both claimed that the sedative drug Midazolam would not work properly on them because of their obesity. Jack Jones, 52, was executed on APR-24, using the standard three-drug combination. The procedure started shortly after 7 PM local time. He was pronounced dead at 7:20. It appears to have been a normal execution. A reporter who was observing the execution noted that Jones' lips were moving after the sedative was administered. A spokesperson for the Department of Correction said that Jones was thanking Wendy Kelley, the department director, for her kind treatment of him. The attorneys for Marcel Williams, 46, filed an emergency request with a federal judge to stay his execution. They noted that Jones "was moving his lips and gulping for air" briefly after the sedative was given. Williams did receive a brief stay, but was executed shortly thereafter. He was pronounced dead at 10:33 PM. Kenneth Williams has been scheduled for execution on APR-27. 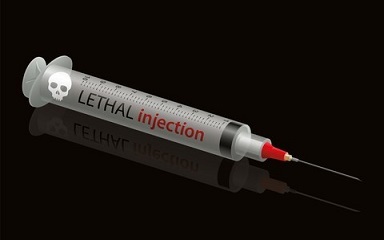 6 The other four inmates' executions had been blocked by the courts because of concern that the injections used might expose the inmates to cruel or unusual punishment. Kenneth Williams was the fourth inmate in a week to be executed the Cummins Unit in Arkansas. During 1999, he had been initially given a sentence of life imprisonment for murdering a woman. He had later escaped from jail but was recaptured after he had shot and killed a truck driver. He had also caused a car accident during a police chase that had resulted in the death of a second man. In 1999 he was sentenced to death. "I was more than wrong. The crimes I perpetrated against you all was [sic] senseless, extremely hurtful and inexcusable. I humbly beg your forgiveness and pray you find the peace, healing and closure you all deserve." After Williams was given the injection of Midazolam, witnesses from the media reported that he was : "coughing, convulsing, lurching, jerking" for 10 to 20 seconds. "This is the most I've seen an inmate move three or four minutes in." He said that Williams had "lurched" 15 times in quick succession, followed by five slower lurches, with the first about three minutes after the sedative Midazolam was injected. 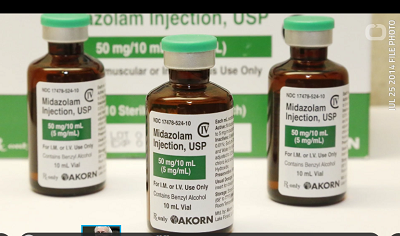 "This is very disturbing, but not at all surprising, given the history of the risky sedative Midazolam, which has been used in many botched executions. ... What's important right now is that all the information about tonight's execution must be meticulously documented and preserved so that we can discover exactly what happened in that execution chamber." J.R. Davis, spokesman for Arkansas Governor. Asa Hutchinson (R), described the lurches as "involuntary muscular reaction to the Midazolam." He did not witness the execution, but concluded that William's reactions did not mean that the procedure had been painful. "... trying to whitewash the reality of what happened." "We tried over and over again to get the state to comport with their own protocol to avoid torturing our client to death, and yet reports from the execution witnesses indicate that Mr. Williams suffered during this execution."